ENDUSER by Tomas Penc is an evolving two-part exhibition taking place in Triskel Christchurch over three months. 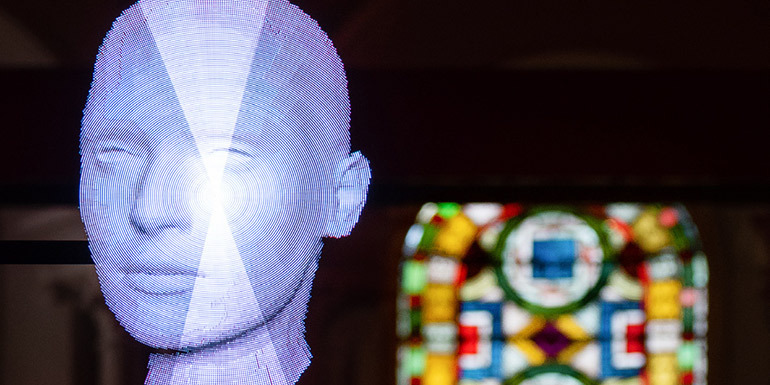 This site-specific installation alludes to our mind-set we, as users, hold towards science and technology and its revolutionary potential that allows us to contest the boundaries of our collective existence traditionally demarcated by the external concept of God. This trend, however, also entails some dark aspects of how we relate to ourselves, one another, and our environment, all of which is the subject matter of the exhibited artwork. Penc’s multifaceted visual arts practice draws from psychology and symbolism used in advertising industry, visual art references and popular culture signifiers and the ways they determine meaning and frame of perception in the current world. It is concerned with the unresolved relationship we have with the present day technology as the “new reality” through which this perceived world is operated, both in abstract and material terms. The first part of ENDUSER will run from Thursday 11 October to Wednesday 7 November. The second part will run from Thursday 22 November to Saturday 22 December. Artist and writer Daire O’Shea discusses his critical response to the ENDUSER exhibition with Tomas Penc, followed by a Q&A session with the audience on Thursday 22 November at 6pm. This talk is free and all are welcome. Tomas Penc has successfully completed a BA Honours Degree in Fine Art at CIT Crawford College of Art & Design, Cork, Ireland. During this time, he has developed a basis for an independent art practice which has been recognized by CIT with The Best CIT CCAD Honours Degree Student Award as well as a 6-month residency in one of the leading Irish arts organisations, the National Sculpture Factory. Following up on his previous film study and Information Technology related work experience, he has developed production and visual research utilising new technologies, such as 3D animation and 3D printing and has completed residencies in Ireland and abroad. He received several grants and funding including the Arts Council of Ireland, Cork City Arts Office and the Valerie Gleeson Development Bursary. The exhibition has been realised with support or funding from Triskel Arts Centre, Valerie Gleeson Development Bursary, National Sculpture Factory, Cork City Council Arts Office and The Arts Council of Ireland. The exhibition is open on the following dates and times and closes on Saturday, December 22 at 4pm.